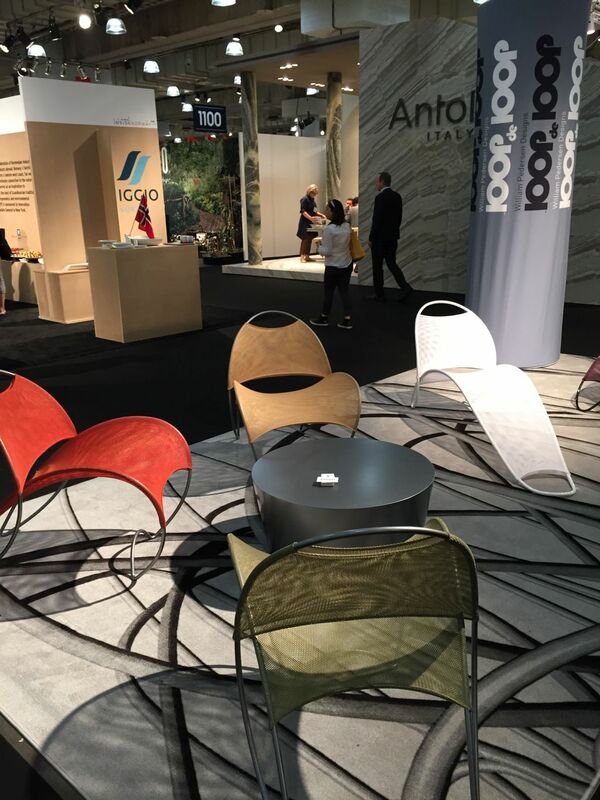 Homedit spent two days seeing and learning about fantastic new products and designs at the International Contemporary Furniture Fair (ICFF) 2015. 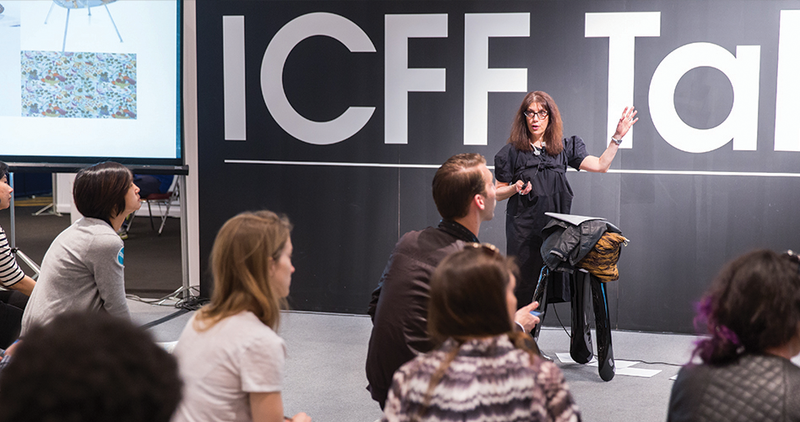 We’re excited to show you what we saw and share the trends and innovative new designs that were on display. 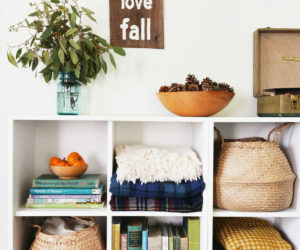 Here’s a sneak peak — we’ll be featuring trends and designs over the next few weeks. 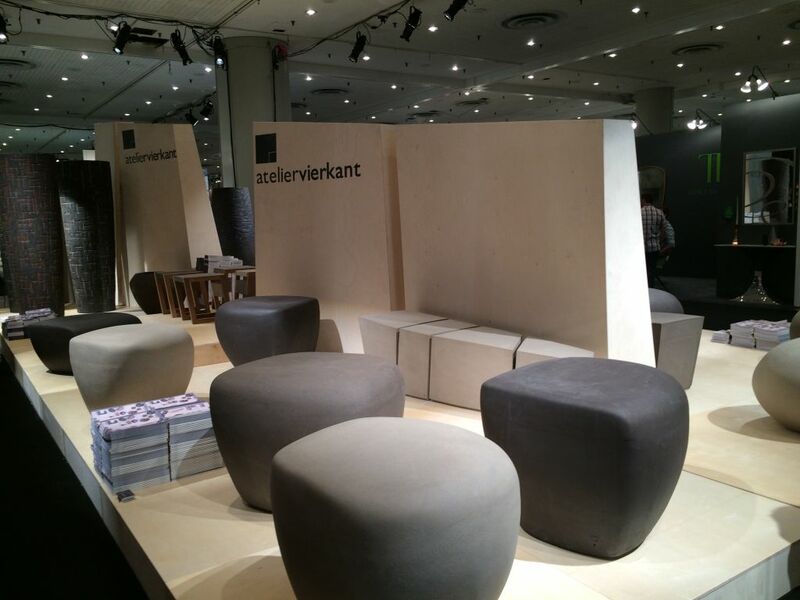 More than 700 vendors presented their wares for indoors as well as outdoors, such as this playful seating line from Atelier Vierkant. Called the K-series, it resembles oversized pebbles. 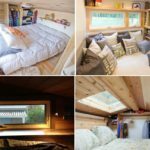 Making the most of the space you have was a common theme. 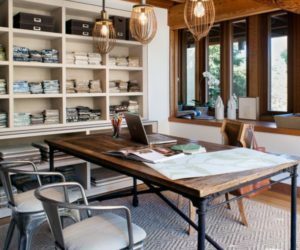 Designers presented a wide variety of creative lines that allow for maximum storage and multitasking spaces. 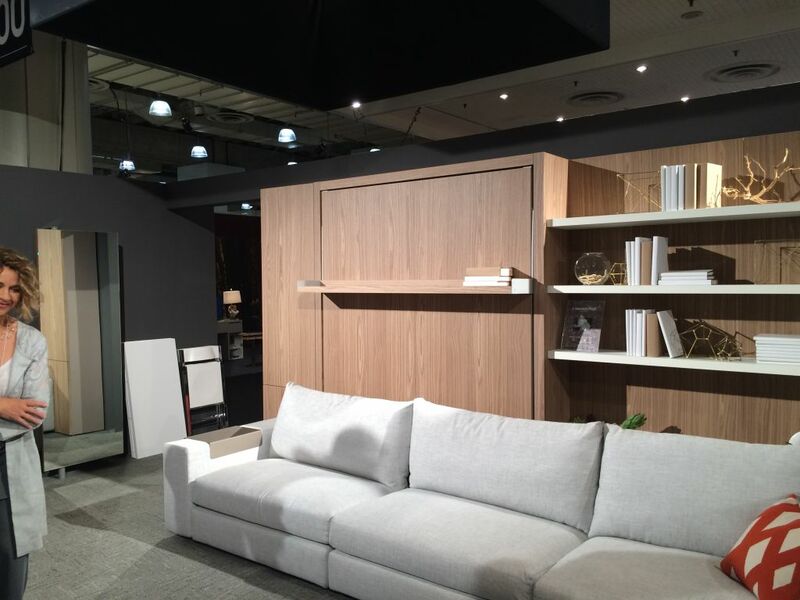 Resource Furniture demonstrated its designs for a multifunctional area that quickly transforms from a living room sofa and wall shelving unit to a bedroom with very little effort. Their Clei wall bed systems maximize every square foot of space. 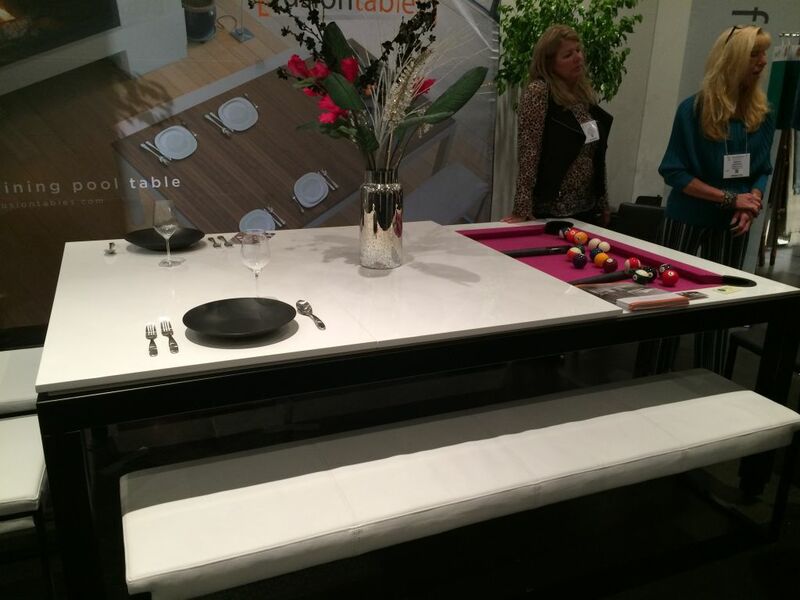 Pool tables take up a substantial amount of space, but Fusion Tables has designed a modern version that converts to a dining table — that seats 10 — in seconds with a special lift mechanism to bring it to the proper height. Variations on stick lighting were everywhere. 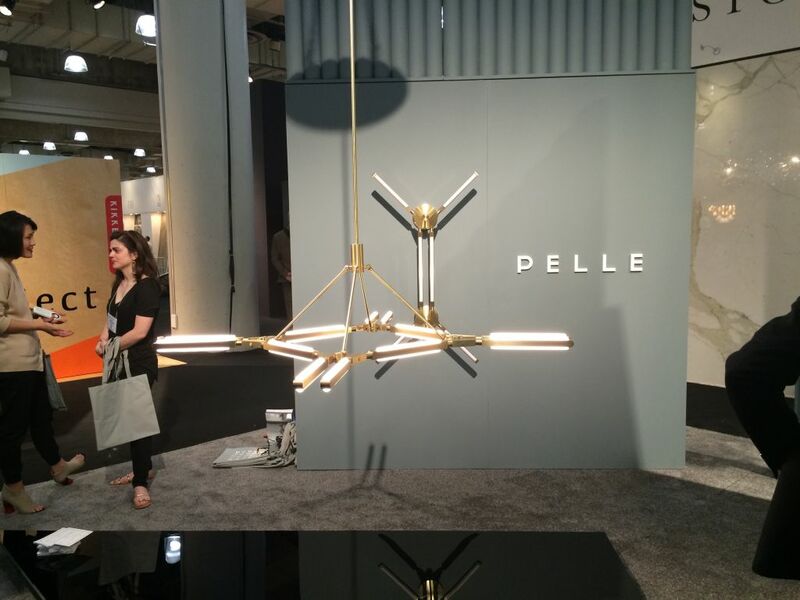 This design from Pelle debuted at ICFF and is a departure in shape from its bubble light designs. 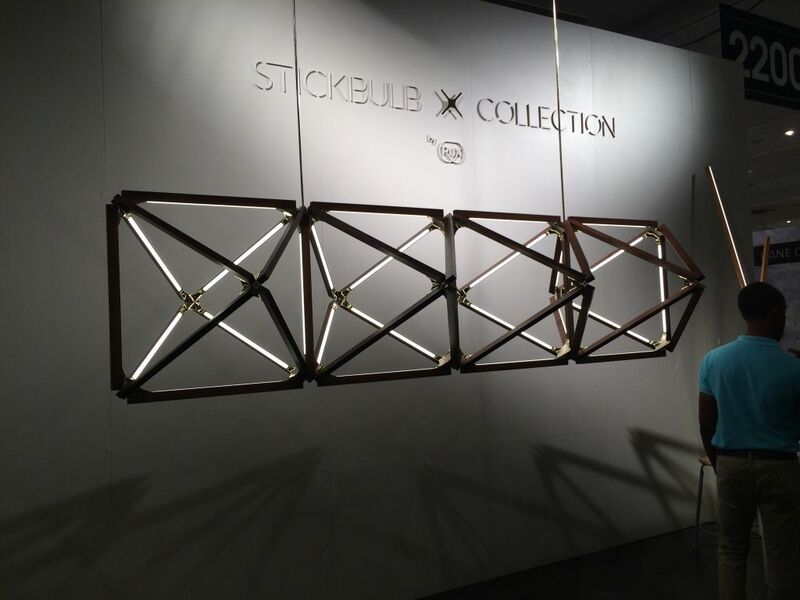 The Stickbulb Collection by Rux features bulbs in lengths up to 6 feet that can be connected in endless variations to create your fixture of choice. 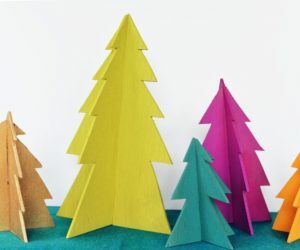 They can also be fashioned into a table base. The LED stickbulbs are produced sustainably and within 5 miles of the company’s headquarters. 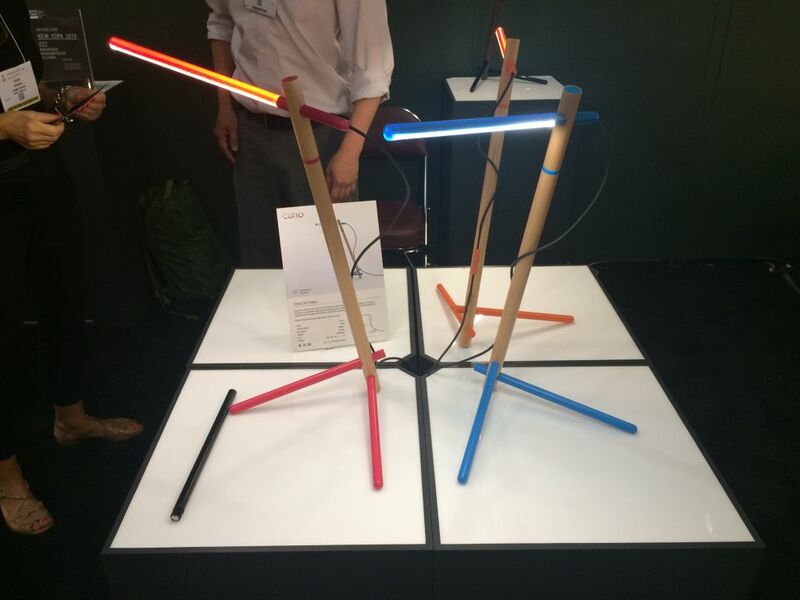 These Structo table and floor lamps by Curio Design use a whimsical design and unique technology. 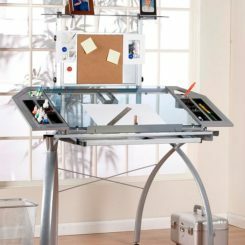 Using LED lights and a scanner bar similar to that of a copy machine, these fixtures avoid multiple shadows and can be controlled with a Bluetooth device. 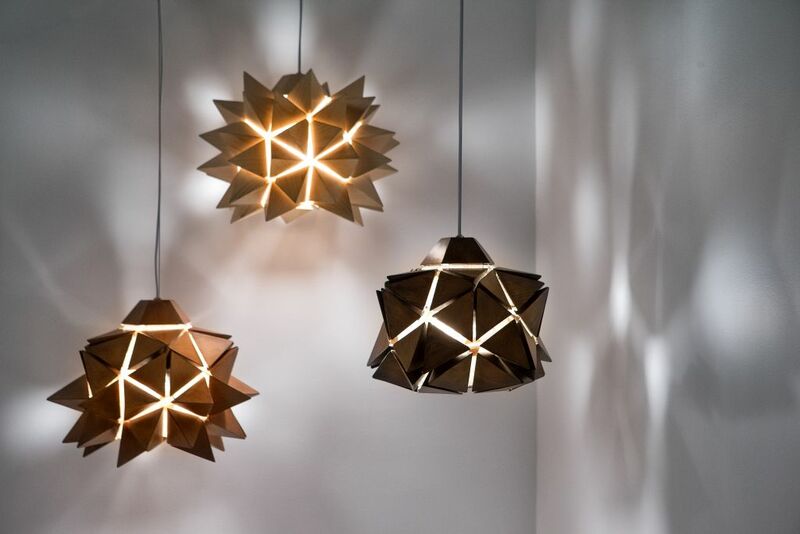 Plenty of lighting designs relied on handcrafting for their modern, unique beauty. 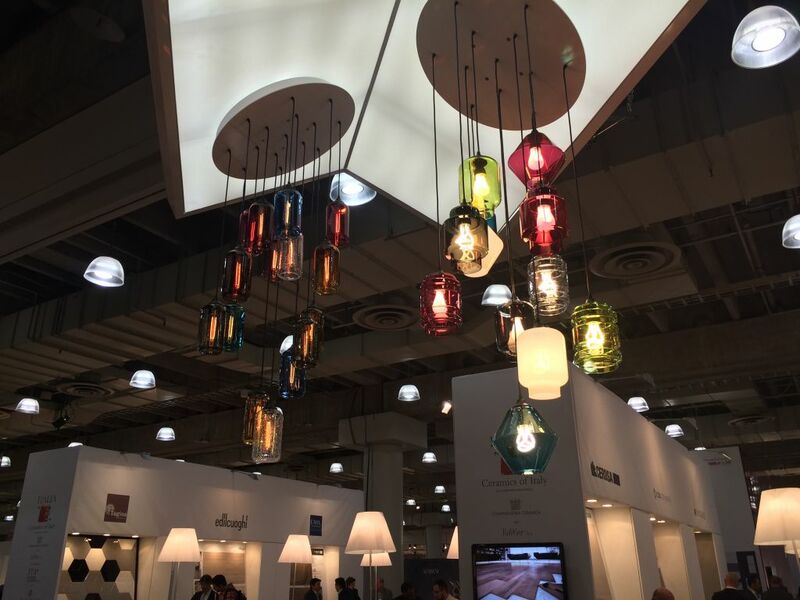 These hand-blown pendants from Niche capitalize on the variety of light bulbs available to enhance the designs. 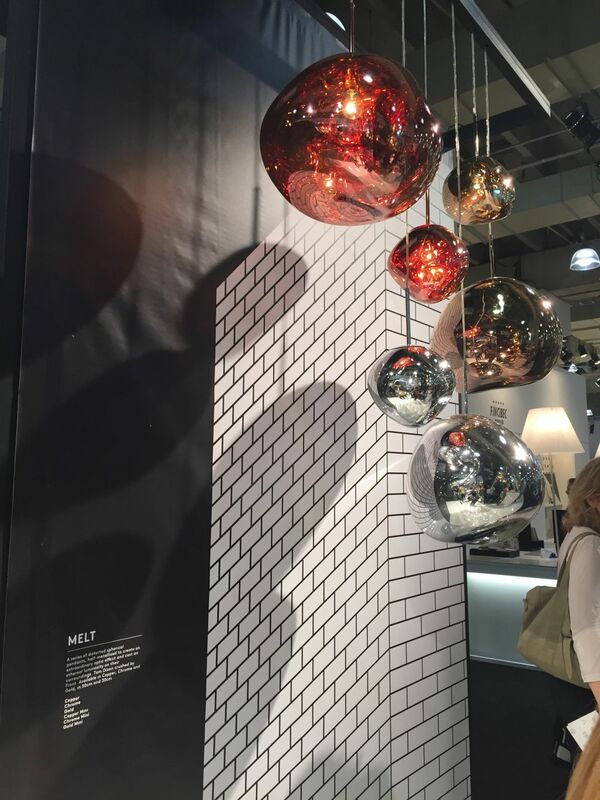 Fascinating molten glass blobs titled “Melt” were part of the collection from Britain’s Tom Dixon, which included furniture as well as many design-forward accessories. 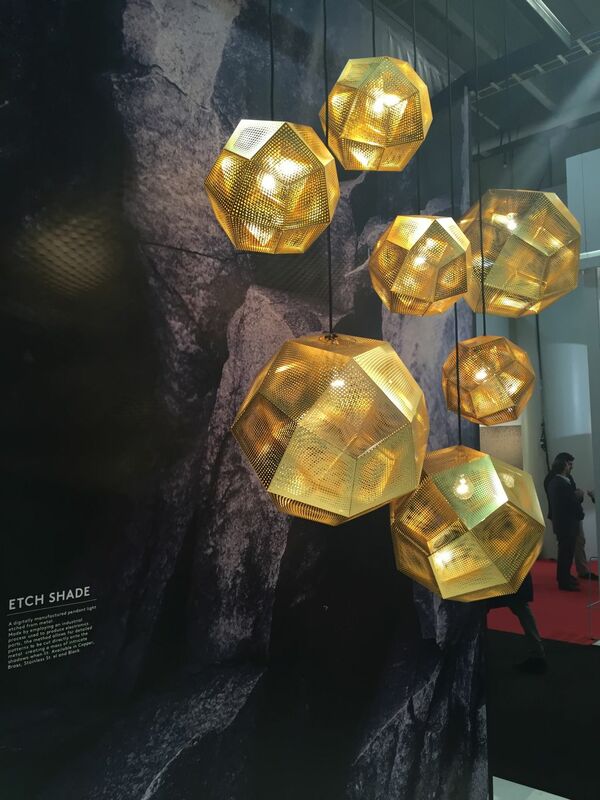 Dixon’s Etch Shade Collection is inspired by mathematics, featuring geodesic shapes fabricated from digitally etched metal sheets. Geometric designs also feature in the work of Vito Selma from the Philippines. 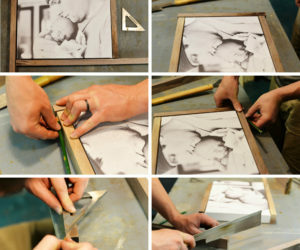 With moveable components, the pyramid-like pieces can be folded inward or outward to change the look. Rafael Avramovich of Work and Design presented a variety of metals in this collection that makes stylish use of negative space. Interior finishes include gold and silver foil. 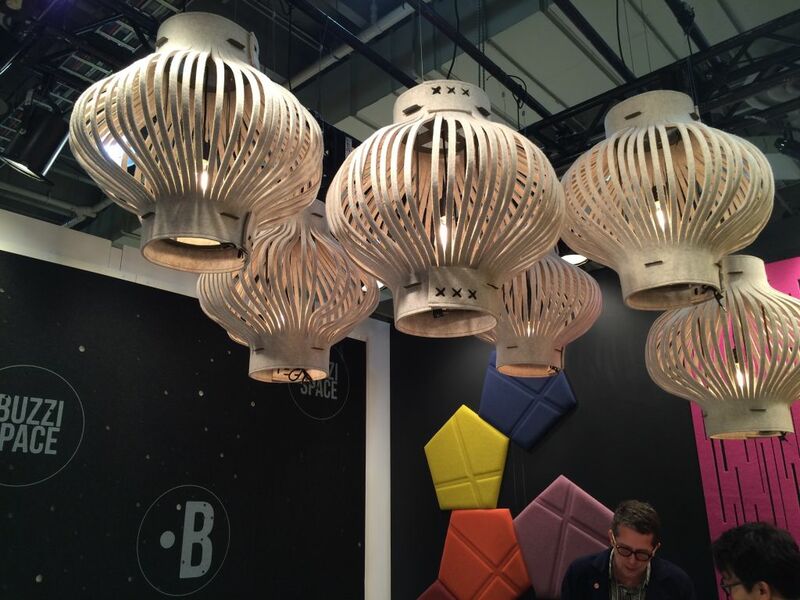 More than just fixtures, lighting innovation carries through to the bulbs themselves. 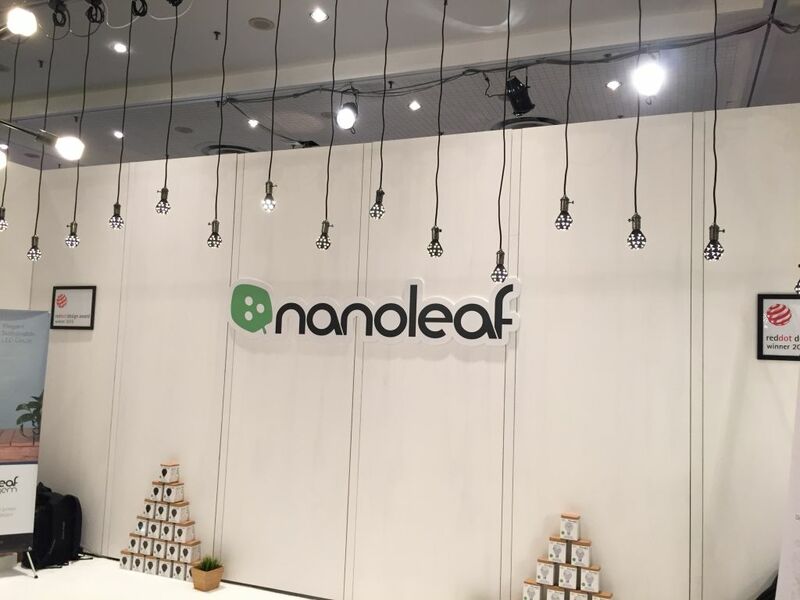 Nanoleaf has invented a dimmable LED bulb that doesn’t need a dimmer switch. The energy-saving bulb is cooler, brighter and more stylish than the average LED bulb. No show is without a plentiful choice of chairs. 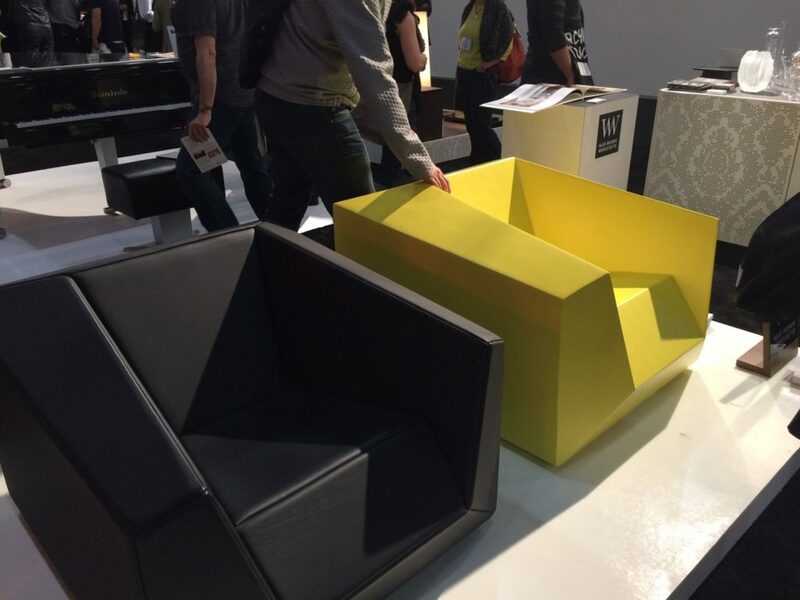 From cushy and cocoonish to angular and spare, new designs filled the entire spectrum. 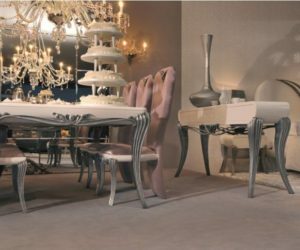 The One Collection showed a variety of comfortable yet stylish designs like this one, which are available upholstered in a number of textile options. 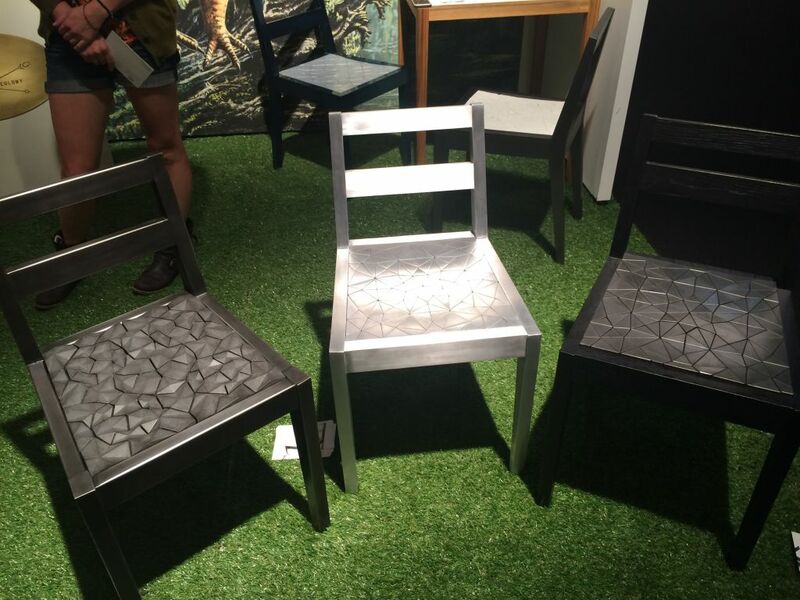 Taking a seat on these chairs by New Colony Furniture was really a surprise! They may look like bumpy seats made of geometric pieces and cracked porcelain, but in reality are cushy chairs. 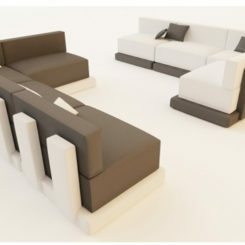 The fractal-like surface is underlined with a special fabric that stretches and gives when you sit down. 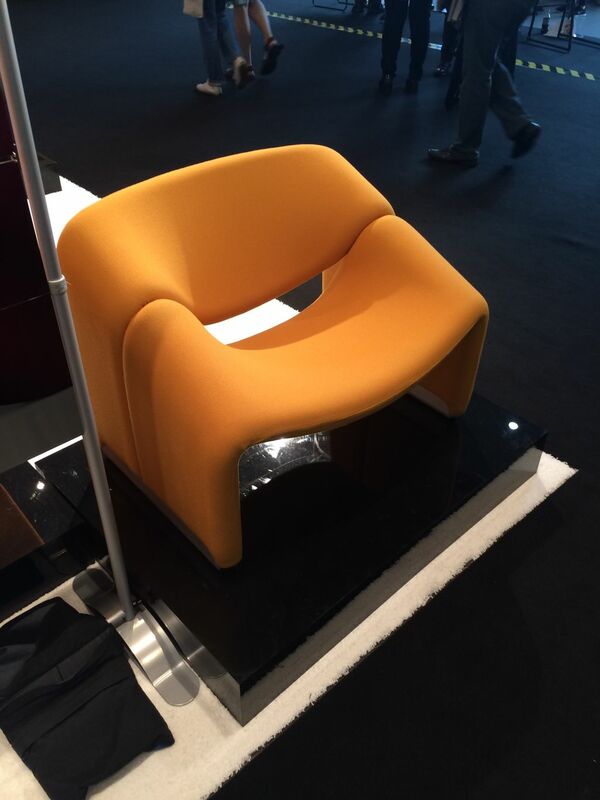 These cubist beauties from Neue Wiener Werkstatte can be had in a variety of colors or in black leather. 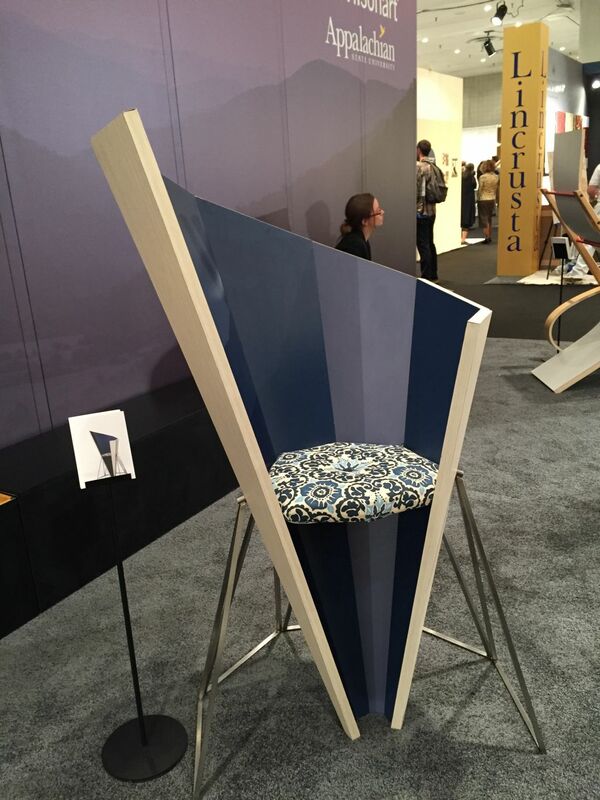 Wilsonart sponsors a student challenge called the Wilsonart Student Chair Design Competition. 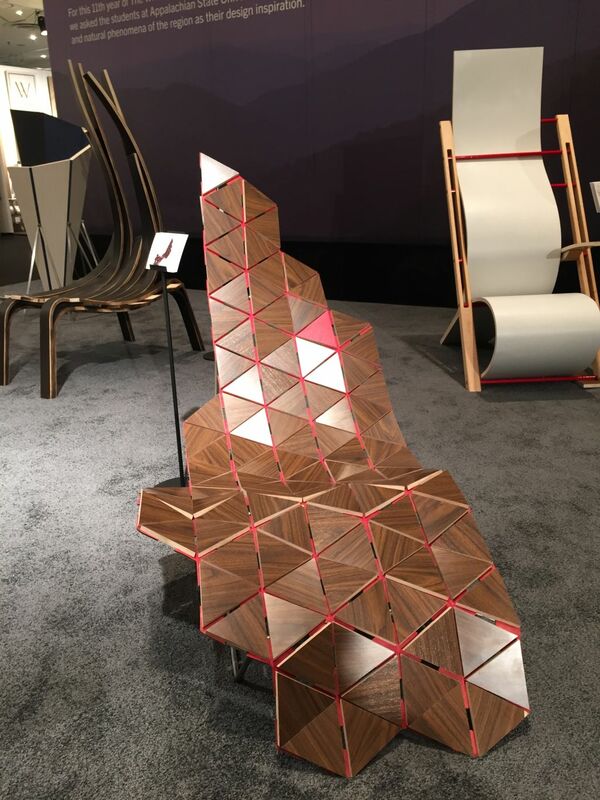 The exciting designs by the finalists were on display, including these chairs…our favorites. A number of university design programs displayed their creations. We found this display by the University of Iowa 3D design program particularly interesting. 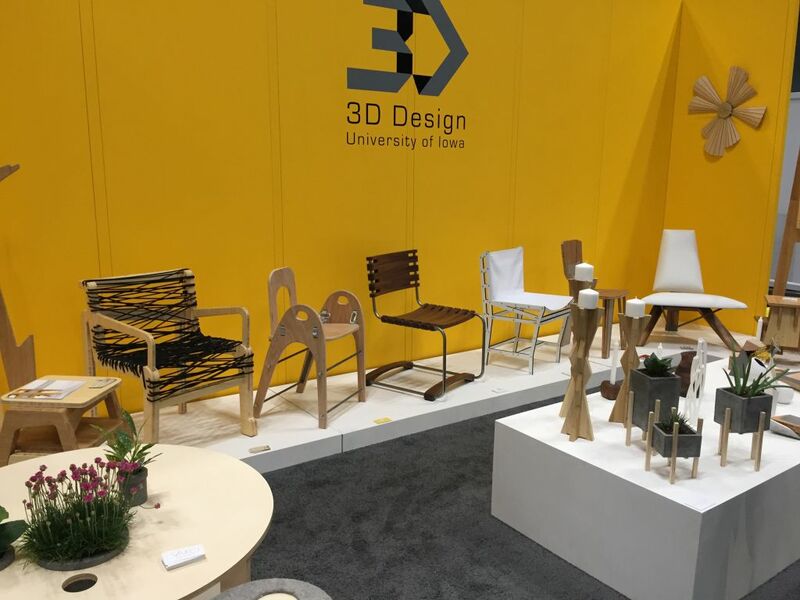 Apparently the ICFF did too because this group won the ICFF Editors’ Award for the Best School, recognizing the best and most innovative designs at ICFF 2015. Lots of slat chairs were to be found. 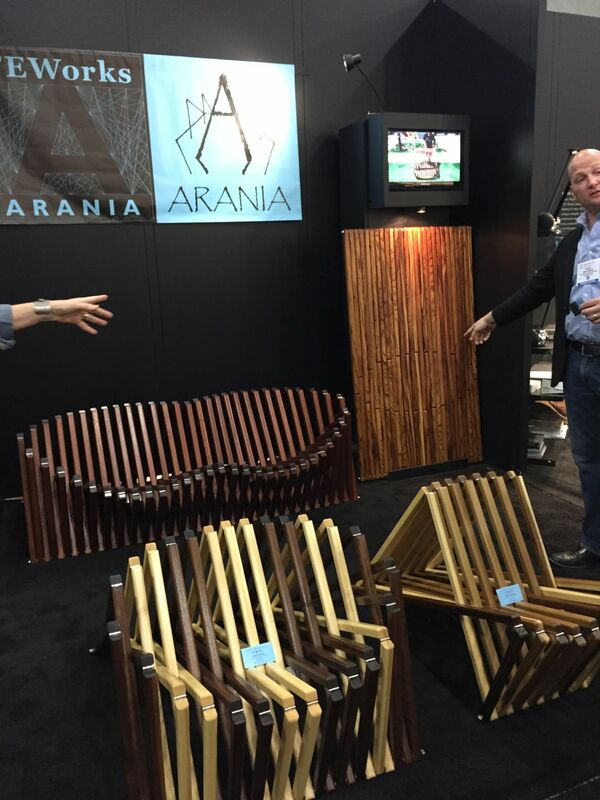 This Arania grouping by FE Works included a variety of woods and larger designs like the love seat. 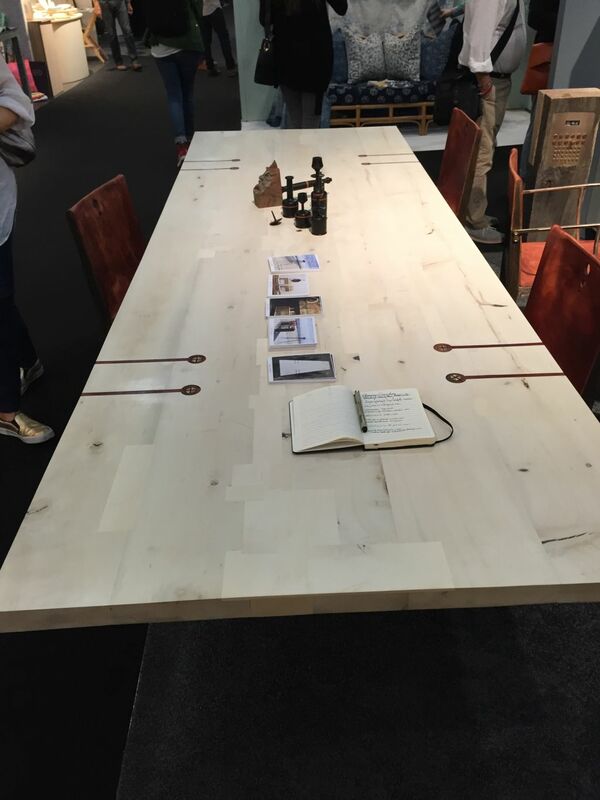 We noticed a greater number of pieces that feature the elegant and unique features of natural wood, from live edge tables to furnishings that highlight variations in the wood, or combine natural wood beauty with accents of brass and other metals. 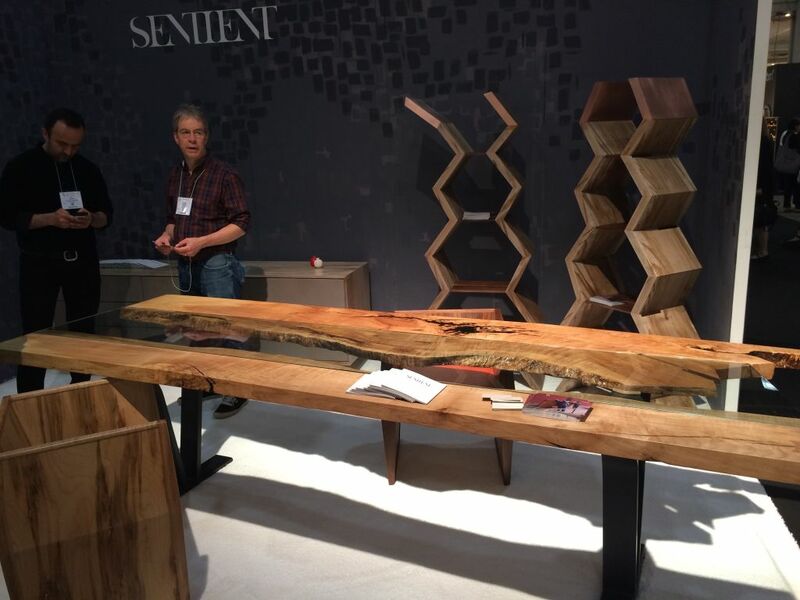 Glass and wood merge into the unique Colorado table by Sentient. The Brooklyn-based company uses sustainably sourced American black walnut, spalted maple, cherry, oak and other hardwoods. 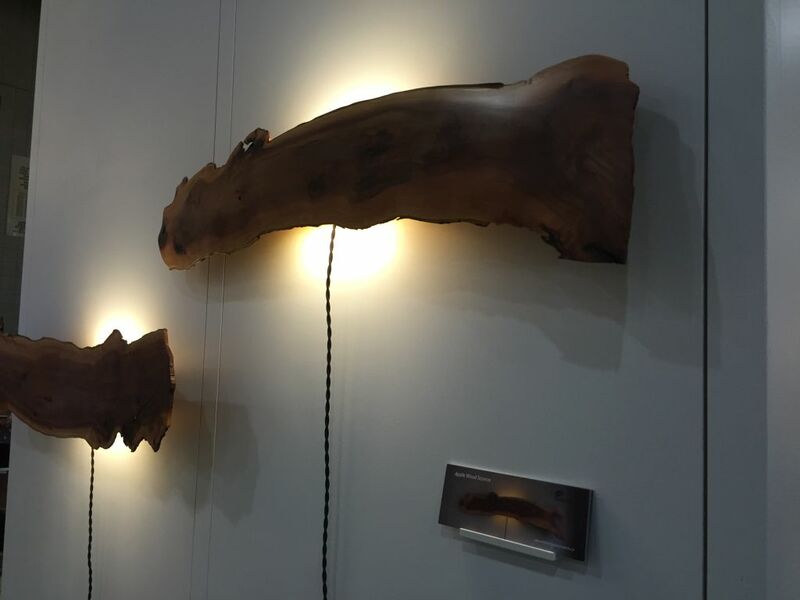 Ontario Wood featured not only live edge tables and shelving, but these applewood sconces from Steven Henderson, where the light enhances the natural glow of the wood to a very warm look. 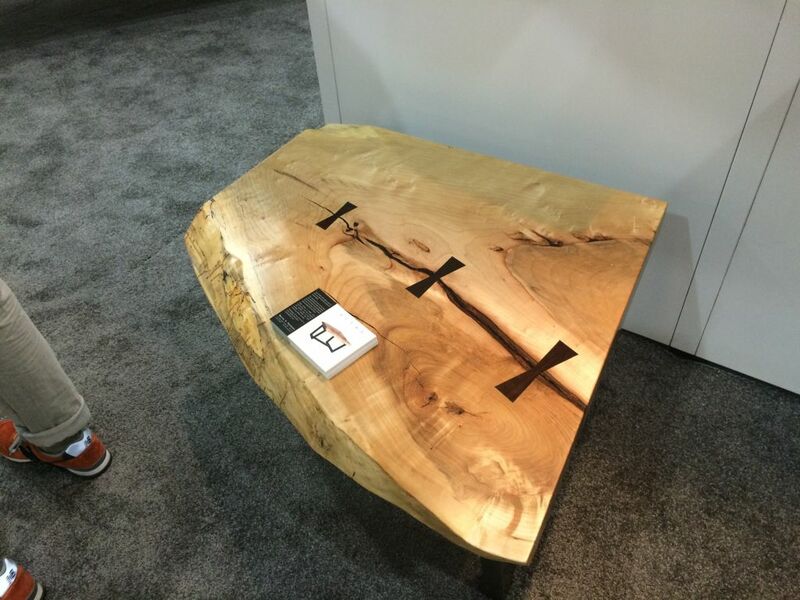 While not a live edge item, this Palo Samko pale dining table of natural white oak with a blackened steel base shows off the wood’s grain and colorations. More than just fasteners for the base, the bronze screws are a vital design element. 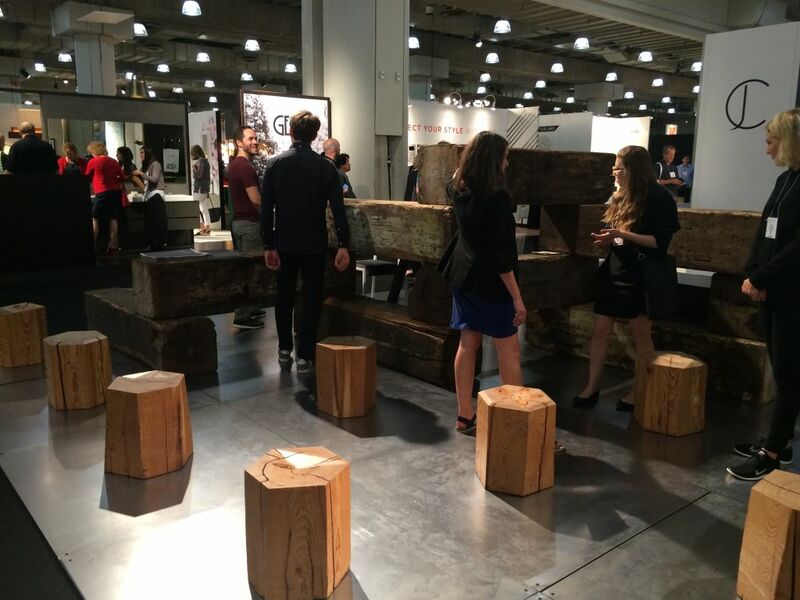 Uhuru, which highlights the creative reuse of naturally weathered materials, featured an installation of beams from a former Domino Sugar factory. 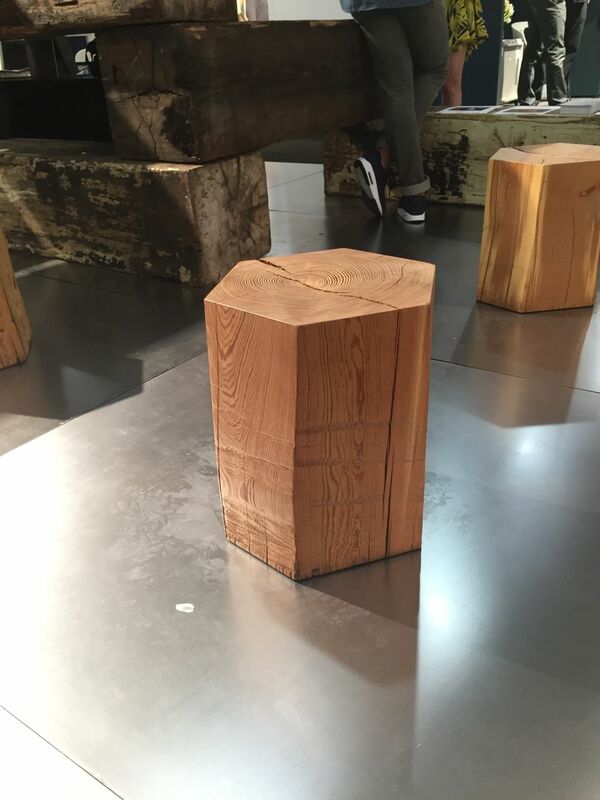 The beams where then transformed into these limited edition seats whose shape is reminiscent of a multifaceted sugar cube. 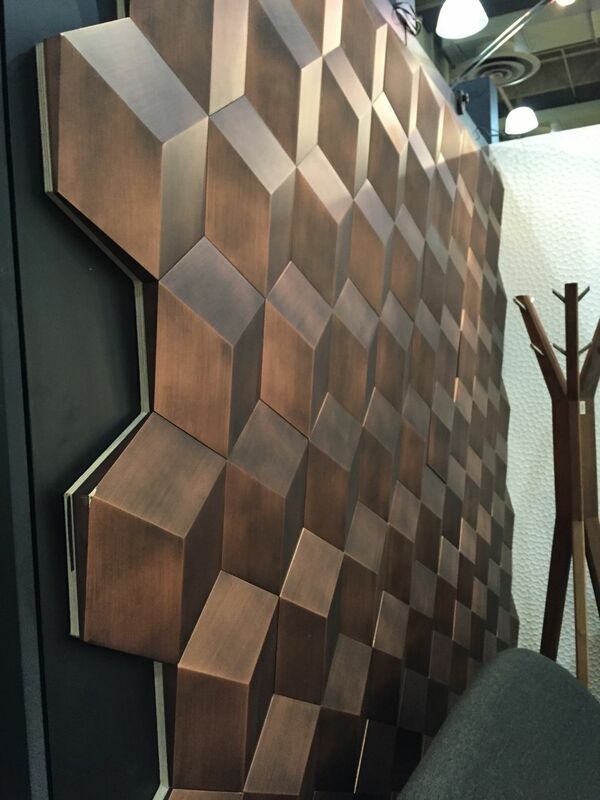 Far beyond the basic wall coverings, ICFF 2015 included a variety of textured options for stunning rooms and accent walls. 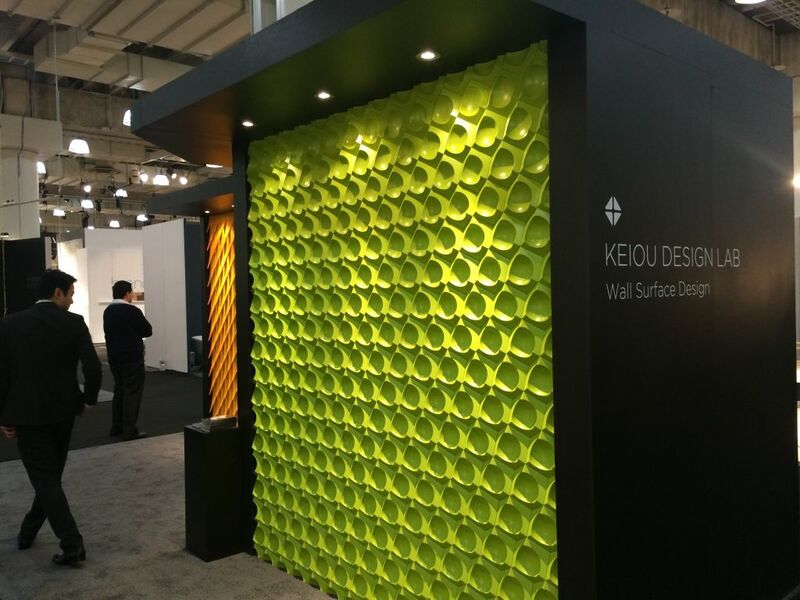 Keiou Design Lab has developed a modular 3-D elements that can be used as wall or ceiling textures. 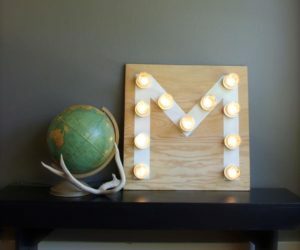 Made from renewable materials (corn!) the lightweight components can be painted as desired with ordinary paint. 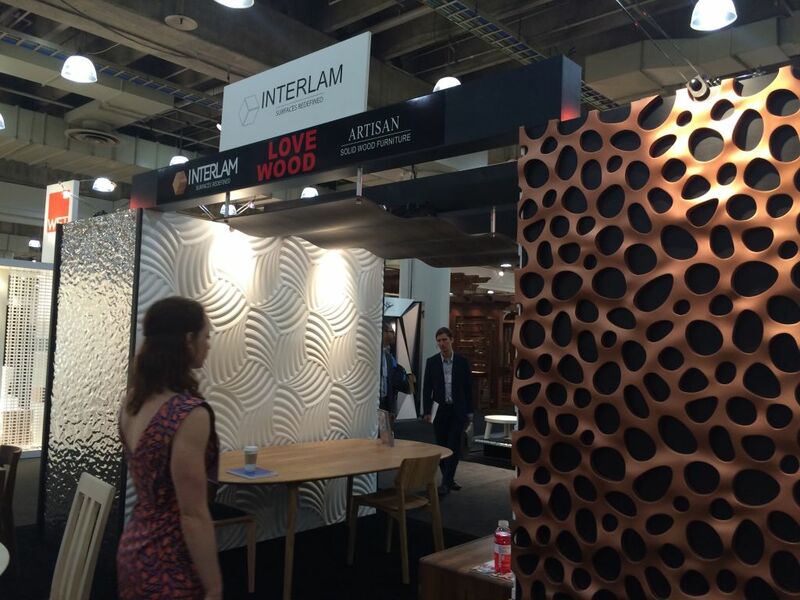 It may look like metal, but these panels by Interlam are all made from wood. 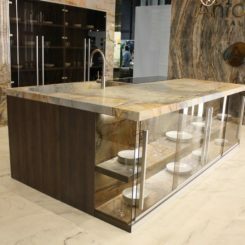 While the line carries a variety of natural wood options, the various metallic finishes were very eye-catching. This intriguing divider is as much art as function. 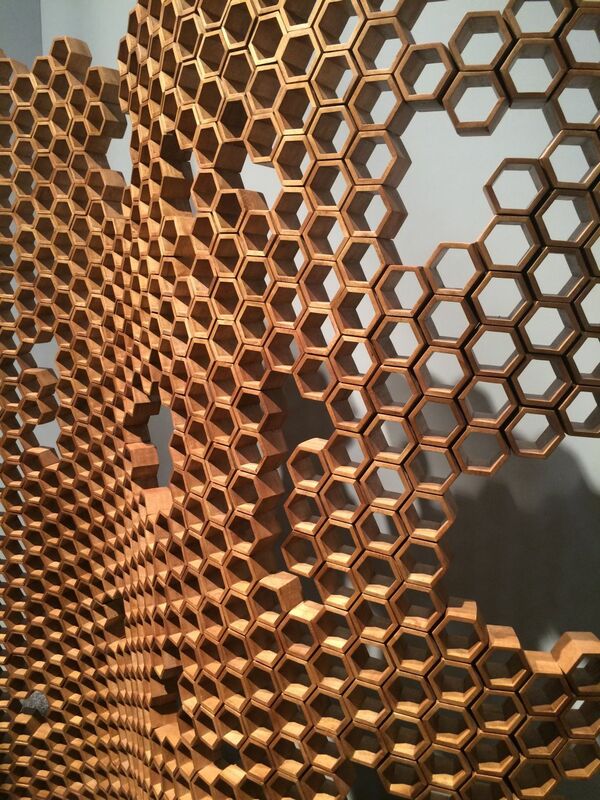 The honeycomb structure of Vito Selma’s piece provides dimension and shadow. The warm wood color is particularly pleasing. 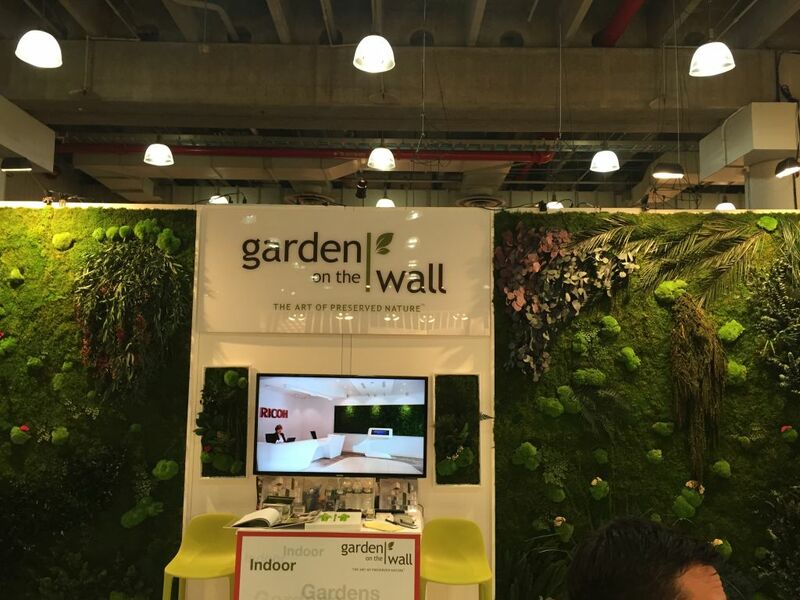 Wall gardens are not news, but Garden on the Wall allows you to have the beauty of nature inside without the dirt, water and mess a traditional garden wall usually involves. Their special process preserves the greens at their peak appearance, allowing you to install an entire wall or smaller accent areas. 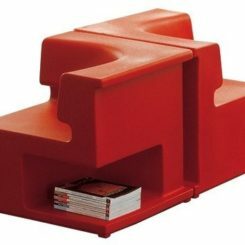 The Loop de Loop collection features the company’s simple yet architecturally sophisticated colorful chairs, fashioned from a single metal tube. 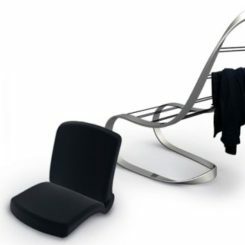 The two layers of non-elastic fabric are stretched over the frame and the chairs are suitable for indoors as well as outdoors. 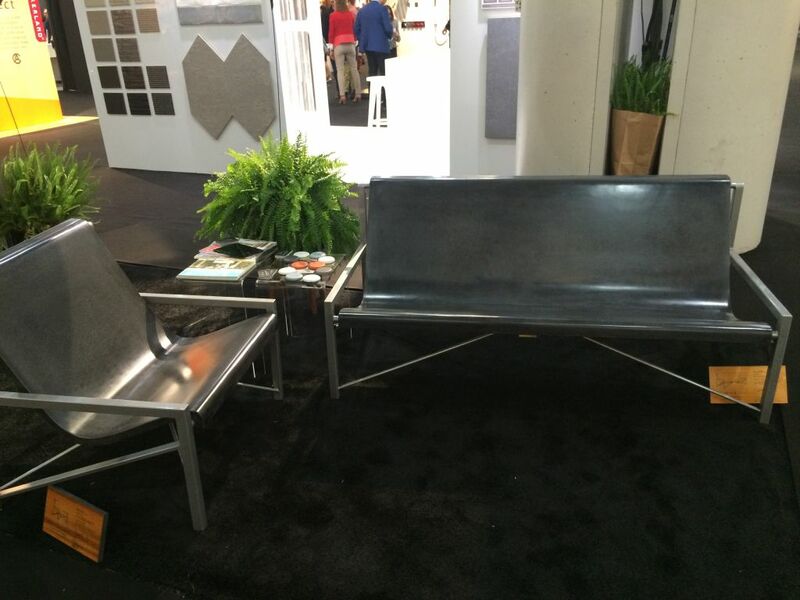 This was a quite a basic looking bench until we found out more: These outdoor furnishings by Galanter and Jones are made from cast stone and are heated! 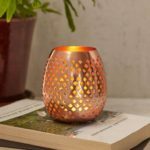 Visually pleasing, we can imagine these cozy pieces making the outdoor season longer and more enjoyable for those who live in cooler climates! 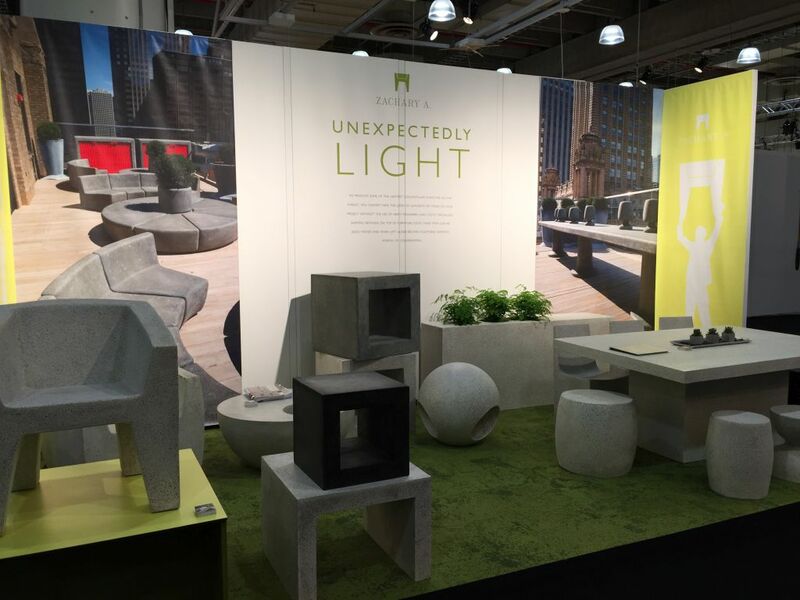 It may look like concrete but it truly is “Unexpectedly Light.” Zachary A Design showed a full range of pieces for both outdoor and indoor use. 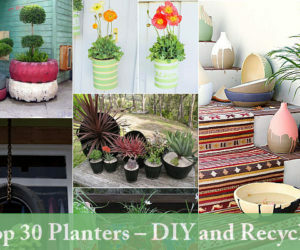 These hand-crafted furnishings and accents are durable and can be left outside year-round. 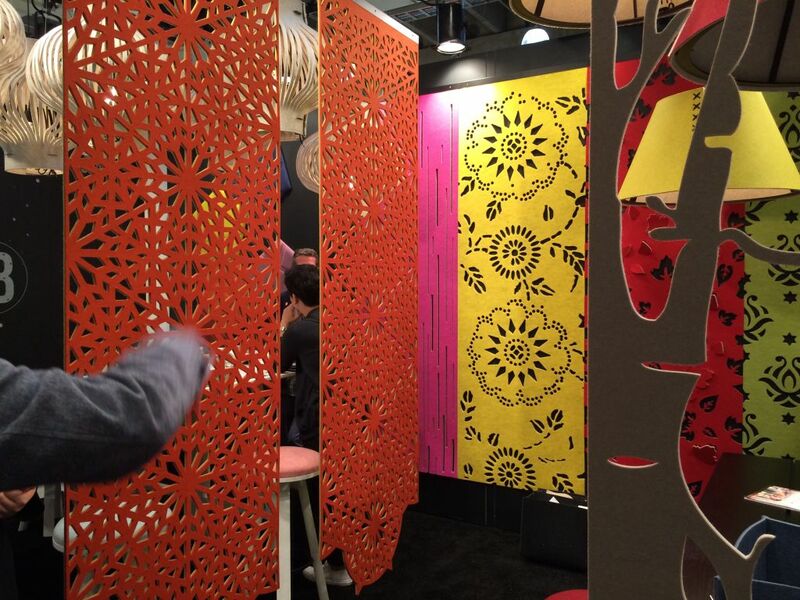 Colorful and dramtic, these lasercut felt panels offer acoustic as well as aesthetic properties. 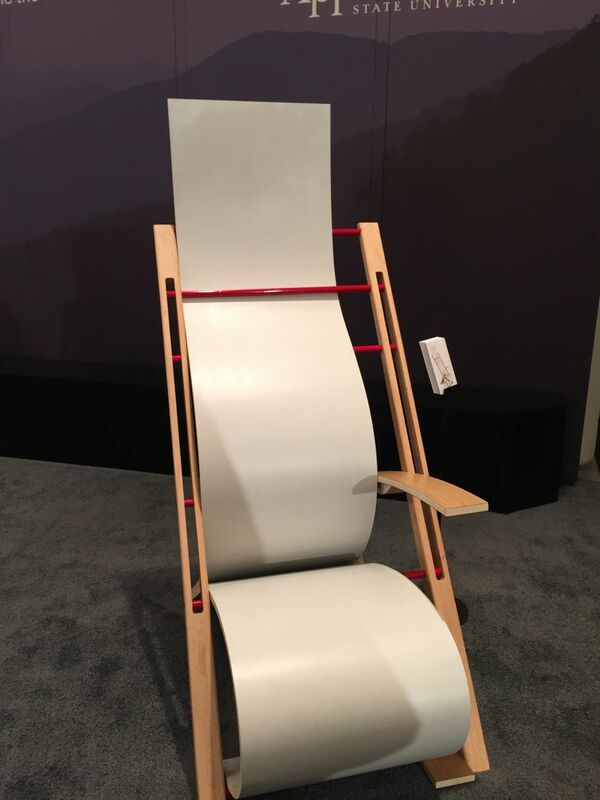 Buzzispace has developed these privacy screens called “Buzzifalls” that also help muffle sound. 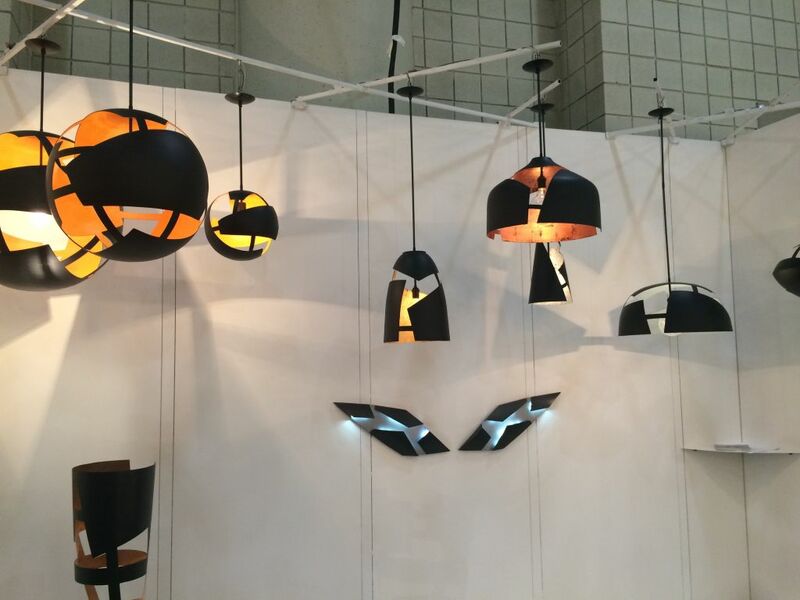 Their line also features lighting and lots of other felt product options. 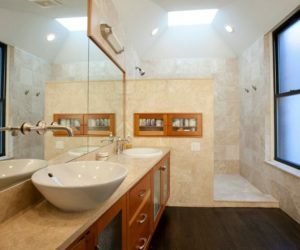 Stand-alone soaking tubs were definitely the trend. From ovals to cubes, tubs like these from Wetstyle are incorporating handy extras that will make soaking in the bath even more delightful. 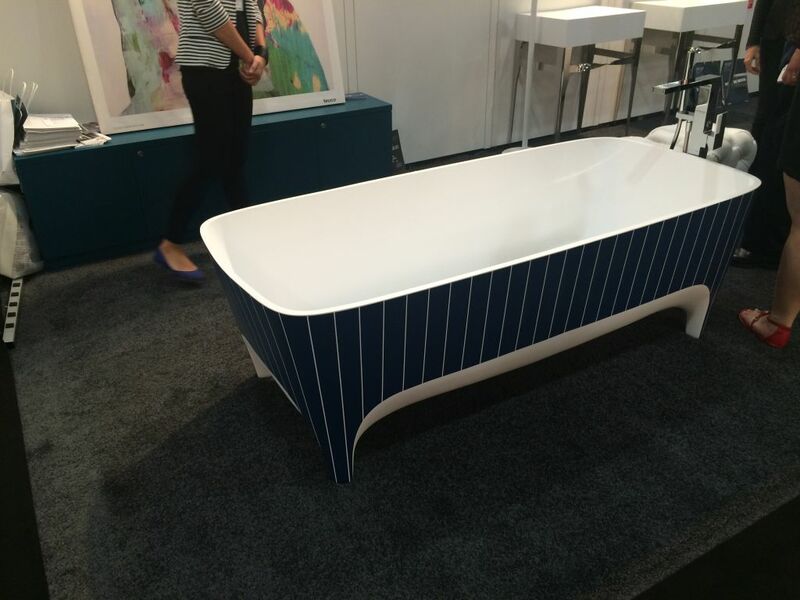 This unique footed tub by Teuco adds a playful element to the bathroom with the navy and white pinstripe design. Plenty of round and oval sinks could be found, but squares and rectangles were the most interesting. 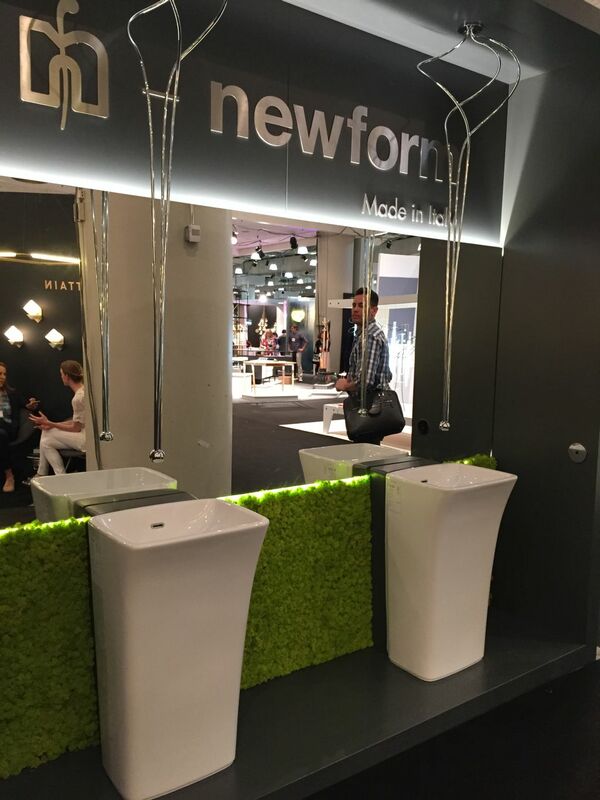 The display of basins from Newform incorporated a garden wall in the design, which is very appealing. 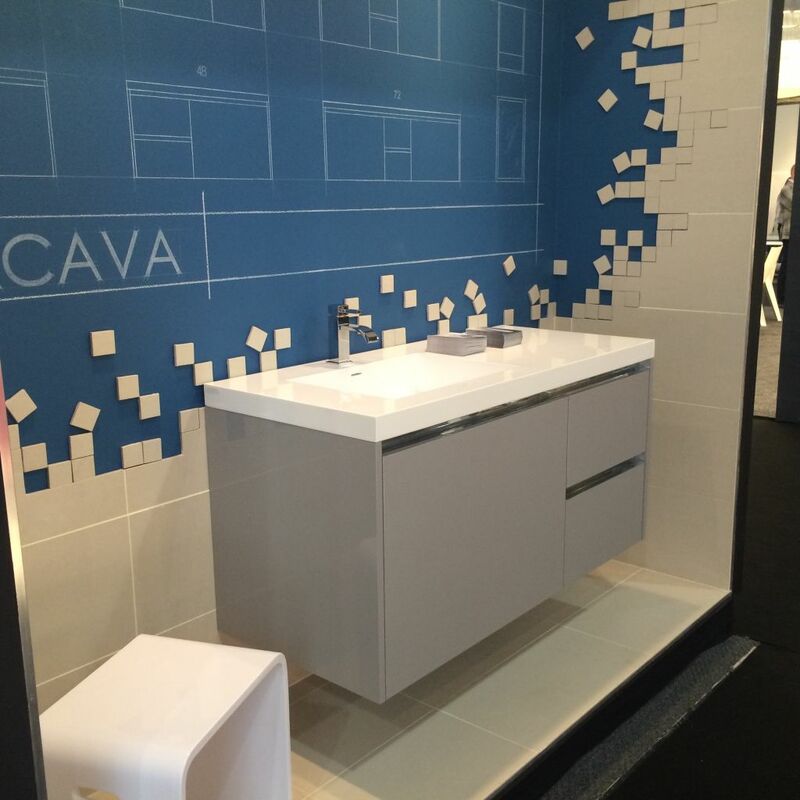 Sleek vanity designs like this one from Cava also incorporated rectangular basins, which highlight the modern look of the cabinetry below. 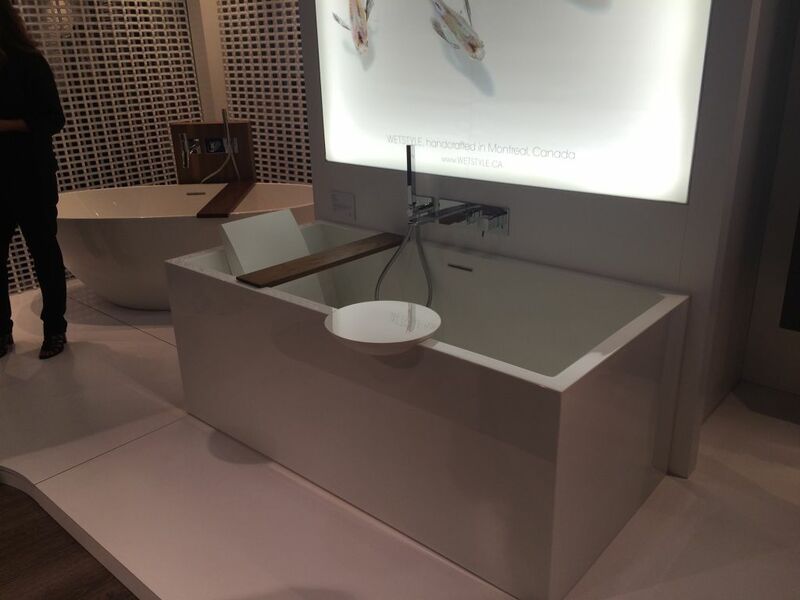 Of course, unusual shapes like this wave form “Nabhi” sink from kreoo make a design statement either singly or on a double vanity like this one. We like the positioning of the faucet on the right, instead of the traditional back side. 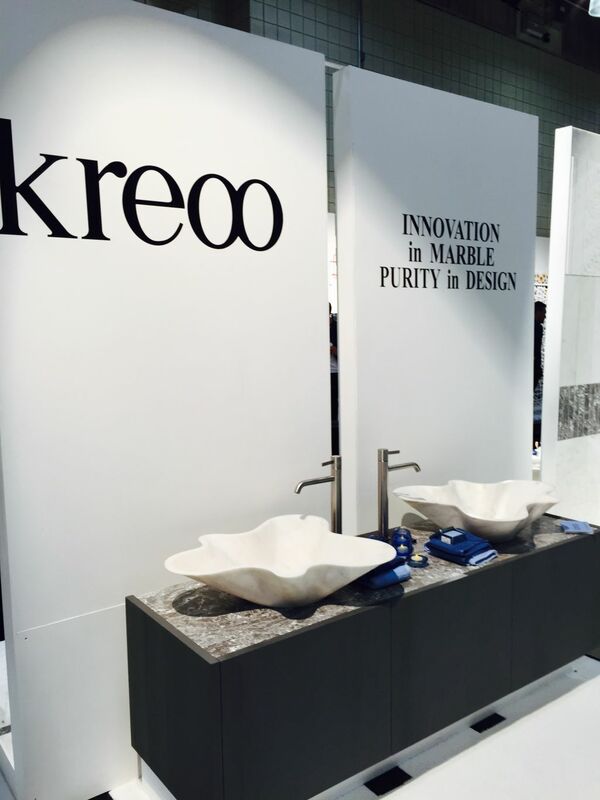 Specialists in marble, kreoo also showed a line of pieces that defy categorization. 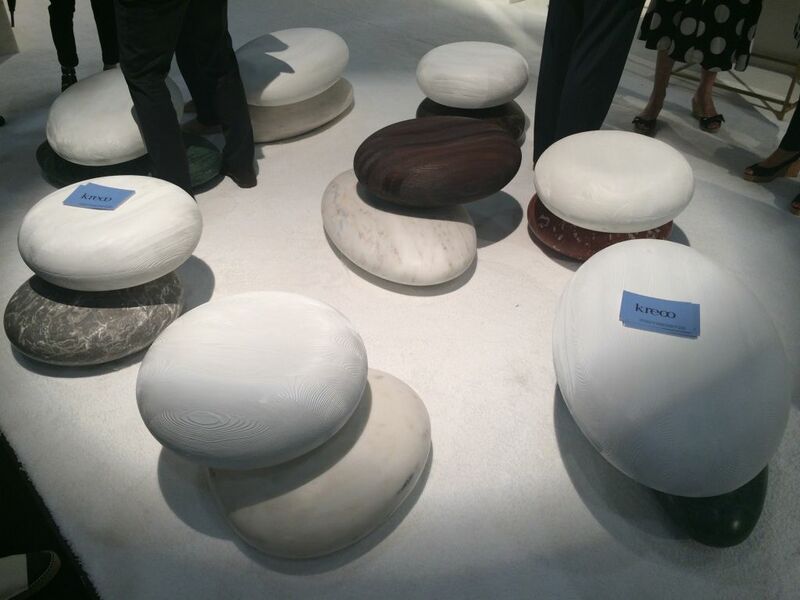 Table or seat, the Pave collection resembles stacked stones. 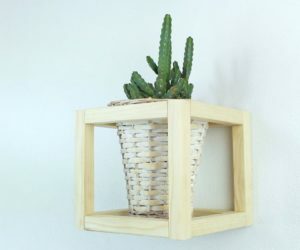 In reality, it is a wood top attached to a marble base. 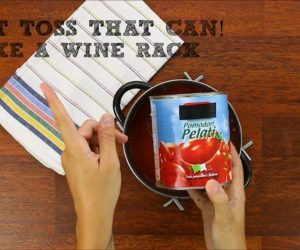 The top stone pivots! 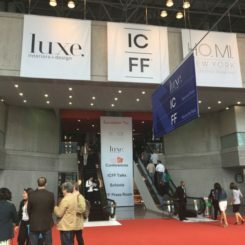 ICFF was a whirlwind of new ideas, from innovative technology to new applications of hand-crafted materials. 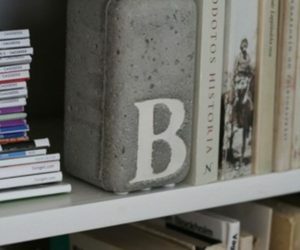 Watch for features on some of the unique designs and products we discovered. 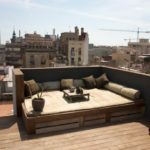 As you create your personal space, how will you merge the new and unique?